Consider your backup and recovery policy, optimize your MobileFirst Server Server configuration, and apply access restrictions and security options. You can create whitelists and blacklists for the endpoints of the IBM MobileFirst Server. Note: Information regarding URLs that are exposed by Mobile Foundation is provided as a guideline. Organizations must ensure the URLs are tested in an enterprise infrastructure, based on what has been enabled for white and black lists. /az/v1/introspection Introspect the client’s access token No. This API is for confidential clients only. /registration/v1/clients/* Registration-service clients API No. This API is for confidential clients only. For MobileFirst Server to communicate with devices that support only Transport Layer Security v1.2 (TLS) V1.2, among the SSL protocols, you must complete the following instructions. The steps to configure MobileFirst Server to enable Transport Layer Security (TLS) V1.2 depend on how MobileFirst Server connects to devices. If MobileFirst Server is behind a reverse proxy that decrypts SSL-encoded packets from devices before it passes the packets to the application server, you must enable TLS V1.2 support on your reverse proxy. If you use IBM HTTP Server as your reverse proxy, see Securing IBM HTTP Server for instructions. If MobileFirst Server communicates directly with devices, the steps to enable TLS V1.2 depend on whether your application serveris Apache Tomcat, WebSphere Application Server Liberty profile, or WebSphere Application Server full profile. Edit the conf/server.xml file and modify the Connector element that declares the HTTPS port so that the sslEnabledProtocols attribute has the following value: sslEnabledProtocols="TLSv1.2,TLSv1.1,TLSv1,SSLv2Hello". Confirm that the Java Runtime Environment (JRE) supports TLS V1.2. If you use an IBM Java SDK, ensure that your IBM Java SDK is patched for the POODLE vulnerability. You can find the minimum IBM Java SDK versions that contain the patch for your version of WebSphere Application Server in Security Bulletin: Vulnerability in SSLv3 affects IBM WebSphere Application Server (CVE-2014-3566). Note: You can use the versions that are listed in the security bulletin or later versions. If you use an IBM Java SDK, edit the server.xml file. Add the sslProtocol="SSL_TLSv2" attribute to all existing <ssl> elements. Ensure that your IBM Java SDK is patched for the POODLE vulnerability. You can find the minimum IBM Java SDK versions that contain the patch for your version of WebSphere Application Server in Security Bulletin: Vulnerability in SSLv3 affects IBM WebSphere Application Server (CVE-2014-3566). Log in to WebSphere Application Server administrative console, and click Security → SSL certificate and key management → SSL configurations. For each SSL configuration listed, modify the configuration to enable TLS V1.2. Select an SSL configuration and then, under Additional Properties, click Quality of protections (QoP) settings. From the Protocol list, select SSL_TLSv2. Click Apply and then save the changes. MobileFirst Server administration requires user authentication. You can configure user authentication and choose an authentication method. Then, the configuration procedure depends on the web application server that you use. Important: If you use stand-alone WebSphere Application Server full profile, use an authentication method other than the simple WebSphere authentication method (SWAM) in global security. You can use lightweight third-party authentication (LTPA). If you use SWAM, you might experience unexpected authentication failures. You must configure authentication after the installer deploys the MobileFirst Server administration web applications in the web application server. You must map the roles to the corresponding sets of users. The mfpmonitor role can view data but cannot change any data. The following tables list MobileFirst roles and functions for production servers. Basically, all roles can issue GET requests, the mfpadmin, mfpdeployer, and mfpmonitor roles can also issue POST and PUT requests, and the mfpadmin and mfpdeployer roles can also issue DELETE requests. Get the subscription information that is associated with a subscription ID. If you choose to use an authentication method through a user repository such as LDAP, you can configure the MobileFirst Server administration so that you can use users and groups with the user repository to define the Access Control List (ACL) of the MobileFirst Server administration. This procedure depends on the type and version of the web application server that you use. Configure security by mapping the MobileFirst Server administration Java EE roles to a set of users for both web applications. Select Security → Global Security. Select Security Configuration Wizard to configure users. You can manage individual user accounts by selecting Users and Groups → Manage Users. Map the roles mfpadmin, mfpdeployer, mfpmonitor, and mfpoperator to a set of users. Select Servers → Server Types → WebSphere application servers. In the Configuration tab, select Applications → Enterprise applications. In the Configuration tab, select Details → Security role to user/group mapping. Repeat the steps to map the roles for the console web application. This time select MobileFirst_Administration_Console. In WebSphere Application Server Liberty profile, you configure the roles of mfpadmin, mfpdeployer, mfpmonitor, and mfpoperator in the server.xml configuration file of the server. To configure the security roles, you must edit the server.xml file. In the <application-bnd> element of each <application> element, create <security-role> elements. Each <security-role> element is for each roles: mfpadmin, mfpdeployer, mfpmonitor, and mfpoperator. Map the roles to the appropriate user group name, in this example: mfpadmingroup, mfpdeployergroup, mfpmonitorgroup, or mfpoperatorgroup. These groups are defined through the <basicRegistry> element. You can customize this element or replace it entirely with an <ldapRegistry> element or a <safRegistry> element. Then, to maintain good response times with a large number of installed applications, for example with 80 applications, you should configure a connection pool for the administration database. You must configure the Java EE security roles for the MobileFirst Server administration on the Apache Tomcat web application server. You can define the set of users as described in the Apache Tomcat documentation, Realm Configuration HOW-TO. Configure the JNDI properties for the MobileFirst Server web applications that are deployed to the application server. Set up JNDI properties to configure the MobileFirst Server web applications that are deployed to the application server. In the WebSphere Application Server administration console, go to Applications → Application Types → WebSphere enterprise applications → application_name → Environment entries for Web modules. In the Value fields, enter values that are appropriate to your server environment. The context root (in the previous example: app_context_root) connects between the JNDI entry and a specific MobileFirst application. If multiple MobileFirst applications exist on the same server, you can define specific JNDI entries for each application by using the context path prefix. Note: Some properties are defined globally on WebSphere Application Server Liberty, without prefixing the property name by the context root. For a list of these properties, see Global JNDI entries. For the live update service, the context root must be /[adminContextRoot]config. For example, if the context root of the administration service is /mfpadmin, then the context root of the live update service must be /mfpadminconfig. For the push service, you must define the context root as /imfpush. Otherwise, the client devices cannot connect to it as the context root is hardcoded in the SDK. For the MobileFirst Administration Service application, the MobileFirst Operations Console and MobileFirst runtime, you can define the context root as you want. However, by default it is /mfpadmin for MobileFirst Administration Service, /mfpconsole for MobileFirst Operations Console, and /mfp for MobileFirst runtime. The context path prefix is not needed because the JNDI entries are defined inside the <Context> element of an application. The type attribute is always java.lang.String, unless specified differently for the property. If you install with Ant tasks, you can also set the values of the JNDI properties at installation time. <installmobilefirstadmin>, for MobileFirst Server administration, MobileFirst Operations Console, and live update services. For more information, see Ant tasks for installation of MobileFirst Operations Console, MobileFirst Server artifacts, MobileFirst Server administration, and live update services. <installmobilefirstruntime>, for MobileFirst runtime configuration properties. For more information, see Ant tasks for installation of MobileFirst runtime environments. <installmobilefirstpush>, for configuration of the push service. For more information, see Ant tasks for installation of MobileFirst Server push service. When you configure MobileFirst Server administration service and MobileFirst Operations Console for your application server, you set optional or mandatory JNDI properties, in particular for Java Management Extensions (JMX). The following properties can be set on the administration service web application mfp-admin-service.war. mfp.admin.jmx.connector Optional The Java Management Extensions (JMX) connector type. The possible values are SOAP and RMI. The default value is SOAP. WebSphere Application Server only. mfp.admin.jmx.host Optional Host name for the JMX REST connection. Liberty profile only. mfp.admin.jmx.port Optional Port for the JMX REST connection. Liberty profile only. mfp.admin.jmx.user Mandatory for the Liberty profile and for WebSphere Application Server farm, optional otherwise User name for the JMX REST connection. WebSphere Application Server Liberty profile: The user name for the JMX REST connection. WebSphere Application Server farm: the user name for the SOAP connection. WebSphere Application Server Network Deployment: the user name of the WebSphere administrator if the virtual host mapped to the MobileFirst Server administration application is not the default host. Liberty collective: the user name of the controller administrator that is defined in the <administrator-role> element of the server.xml file of the Liberty controller. mfp.admin.jmx.pwd Mandatory for the Liberty profile and for WebSphere Application Server farm, optional otherwise User password for the JMX REST connection. WebSphere Application Server Liberty profile: the user password for the JMX REST connection. WebSphere Application Server farm: the user password for the SOAP connection. WebSphere Application Server Network Deployment: the user password of the WebSphere administrator if the virtual host that is mapped to the MobileFirst Server server administration application is not the default host. Liberty collective: the password of the controller administrator that is defined in the <administrator-role> element of the server.xml file of the Liberty controller. mfp.admin.rmi.registryPort Optional RMI registry port for the JMX connection through a firewall. Tomcat only. mfp.admin.rmi.serverPort Optional RMI server port for the JMX connection through a firewall. Tomcat only. mfp.admin.jmx.dmgr.host Mandatory Deployment manager host name. WebSphere Application Server Network Deployment only. mfp.admin.jmx.dmgr.port Mandatory Deployment manager RMI or SOAP port. WebSphere Application Server Network Deployment only. mfp.admin.actions.prepareTimeout Optional Timeout in milliseconds to transfer data from the adminstration service to the runtime during a deployment transaction. If the runtime cannot be reached within this time, an error is raised and the deployment transaction ends. mfp.admin.actions.commitRejectTimeout Optional Timeout in milliseconds, when a runtime is contacted, to commit or reject a deployment transaction. If the runtime cannot be reached within this time, an error is raised and the deployment transaction ends. mfp.admin.lockTimeoutInMillis Optional Timeout in milliseconds for obtaining the transaction lock. Because deployment transactions run sequentially, they use a lock. Therefore, a transaction must wait until a previous transaction is finished. This timeout is the maximal time during which a transaction waits. mfp.admin.maxLockTimeInMillis Optional The maximal time during which a process can take the transaction lock. Because deployment transactions run sequentially, they use a lock. If the application server fails while a lock is taken, it can happen in rare situations that the lock is not released at the next restart of the application server. In this case, the lock is released automatically after the maximum lock time so that the server is not blocked forever. Set a time that is longer than a normal transaction. mfp.admin.logging.formatjson Optional Set this property to true to enable pretty formatting (extra blank space) of JSON objects in responses and log messages. Setting this property is helpful when you debug the server. Default value: false. mfp.admin.logging.tosystemerror Optional Specifies whether all logging messages are also directed to System.Error. Setting this property is helpful when you debug the server. mfp.admin.proxy.port Optional If the MobileFirst administration server is behind a firewall or reverse proxy, this property specifies the address of the host. Set this property to enable a user outside the firewall to reach the MobileFirst administration server. Typically, this property is the port of the proxy, for example 443. It is necessary only if the protocol of the external and internal URIs are different. mfp.admin.proxy.protocol Optional If the MobileFirst administration server is behind a firewall or reverse proxy, this property specifies the protocol (HTTP or HTTPS). Set this property to enable a user outside the firewall to reach the MobileFirst administration server. Typically, this property is set to the protocol of the proxy. For example, wl.net. This property is necessary only if the protocol of the external and internal URIs are different. mfp.admin.proxy.scheme Optional This property is just an alternative name for mfp.admin.proxy.protocol. mfp.admin.proxy.host Optional If the MobileFirst administration server is behind a firewall or reverse proxy, this property specifies the address of the host. Set this property to enable a user outside the firewall to reach the MobileFirst administration server. Typically, this property is the address of the proxy. mfp.admin.audit Optional. Set this property to false to disable the audit feature of the MobileFirst Operations Console. The default value is true. mfp.admin.environmentid Optional. The environment identifier for the registration of the MBeans. Use this identifier when different instances of the MobileFirst Server are installed on the same application server. The identifier determines which administration service, which console, and which runtimes belong to the same installation. The administration service manages only the runtimes that have the same environment identifier. 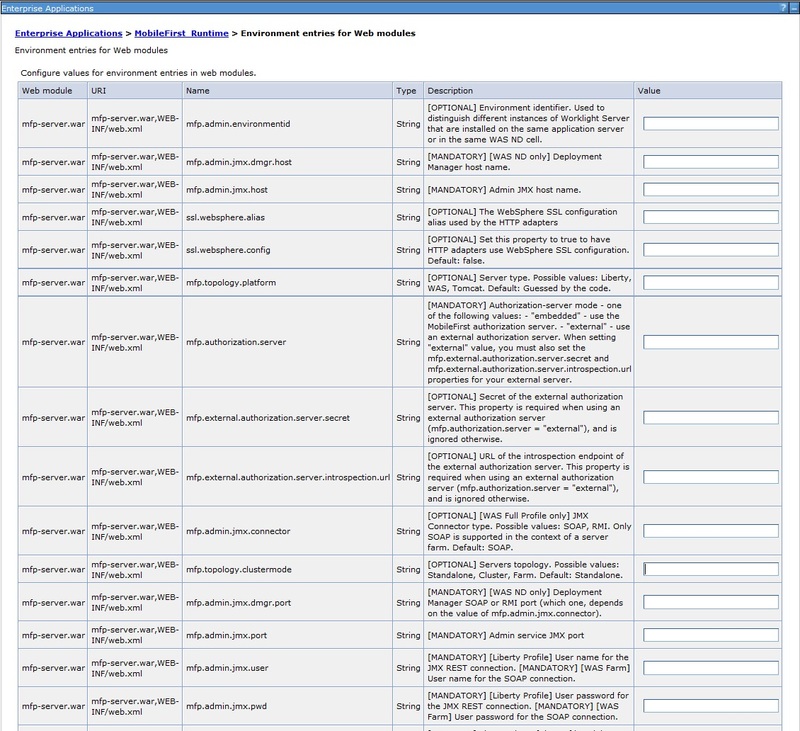 mfp.admin.serverid Mandatory for server farms and Liberty collective, optional otherwise. Server farm: the server identifier. Must be different for each server in the farm. Liberty collective: the value must be controller. mfp.admin.hsts Optional. Set to true to enable HTTP Strict Transport Security according to RFC 6797. If you do not set the value, the application tries to guess the server type. mfp.admin.farm.heartbeat Optional This property enables you to set in minutes the heartbeat rate that is used in server farm topologies. The default value is 2 minutes. In a server farm, all members must use the same heartbeat rate. If you set or change this JNDI value on one server in the farm, you must also set the same value on every other server in the farm. For more information, see Lifecycle of a server farm node. mfp.admin.farm.missed.heartbeats.timeout Optional This property enables you to set the number of missed heartbeats of a farm member before the status of the farm member is considered to be failed or down. The default value is 2. In a server farm all members must use the same missed heartbeat value. If you set or change this JNDI value on one server in the farm, you must also set the same value on every other server in the farm. For more information, see Lifecycle of a server farm node. mfp.admin.farm.reinitialize Optional A Boolean value (true or false) for re-registering or re-initializing the farm member. mfp.server.swagger.ui.url Optional This property defines the URL of the Swagger user interface to be displayed in the administration console. mfp.admin.db.jndi.name Optional The JNDI name of the database. This parameter is the normal mechanism to specify the database. The default value is java:comp/env/jdbc/mfpAdminDS. mfp.admin.db.openjpa.ConnectionDriverName Optional/Conditionally mandatory The fully qualified name of the database connection driver class. Mandatory only when the data source that is specified by the mfp.admin.db.jndi.name property is not defined in the application server configuration. mfp.admin.db.openjpa.ConnectionURL Optional/Conditionally mandatory The URL for the database connection. Mandatory only when the data source that is specified by the mfp.admin.db.jndi.name property is not defined in the application server configuration. mfp.admin.db.openjpa.ConnectionUserName Optional/Conditionally mandatory The ﻿user name for the database connection. Mandatory only when the data source that is specified by the mfp.admin.db.jndi.name property is not defined in the application server configuration. mfp.admin.db.openjpa.ConnectionPassword Optional/Conditionally mandatory The password for the database connection. Mandatory only when the data source that is specified by the mfp.admin.db.jndi.name property is not defined in the application server configuration. mfp.admin.db.openjpa.Log Optional This property is passed to OpenJPA and enables JPA logging. For more information, see the Apache OpenJPA User’s Guide. mfp.admin.db.type Optional This property defines the type of database. The default value is inferred from the connection URL. Host name of the Rational License Key Server. Port number of the Rational License Key Server. mfp.jndi.configuration Optional The name of the JNDI configuration if the JNDI properties (except this one) must be read from a property file that is injected into the WAR file. If you do not set this property, JNDI properties are not read from a property file. mfp.jndi.file Optional The name of the file that contains the JNDI configuration if the JNDI properties (except this one) must be read from a file installed in the web server. If you do not set this property, JNDI properties are not read from a property file. The administration service uses a live update service as an auxiliary facility to store various configurations. Use these properties to configure how to reach the live update service. mfp.config.service.url Optional	The URL of the live update service. The default URL is derived from the URL of administration service by adding config to the context root of the administration service. mfp.config.service.user Mandatory The user name that is used to access the live update service. In a server farm topology, the user name must be the same for all the members of the farm. mfp.config.service.password Mandatory The password that is used to access the live update service. In a server farm topology, the password must be the same for all the members of the farm. mfp.config.service.schema Optional The name of the schema that is used by the live update service. The administration service uses a push service as an auxiliary facility to store various push settings. Use these properties to configure how to reach the push service. Because the push service is protected by the OAuth security model, you must set various properties to enable confidential clients in OAuth. mfp.admin.push.url Optional The URL of the push service. If the property is not specified, the push service is considered disabled. If the property is not properly set, the administration service cannot contact the push service and the administration of push services in MobileFirst Operations Console does not work. mfp.admin.authorization.server.url Optional The URL of the OAuth authorization server that is used by the push service. The default URL is derived from the URL of the administration service by changing the context root to the context root of the first installed runtime. If you install multiple runtimes, it is best to set the property. If the property is not set properly, the administration service cannot contact the push service and the administration of push services in MobileFirst Operations Console does not work. mfp.push.authorization.client.id Optional/conditionally mandatory The identifier of the confidential client that handles OAuth authorization for the push service. Mandatory only if the mfp.admin.push.url property is specified. mfp.admin.authorization.client.id Optional/conditionally mandatory The identifier of the confidential client that handles OAuth authorization for the administration service. Mandatory only if the mfp.admin.push.url property is specified. mfp.admin.authorization.client.secret Optional/conditionally mandatory The secret of the confidential client that handles OAuth authorization for the administration service. Mandatory only if the mfp.admin.push.url property is specified. The following properties can be set on the web application (mfp-admin-ui.war) of MobileFirst Operations Console. mfp.admin.endpoint Optional Enables the MobileFirst Operations Console to locate the MobileFirst Server administration REST service. Specify the external address and context root of the mfp-admin-service.war web application. In a scenario with a firewall or a secured reverse proxy, this URI must be the external URI and not the internal URI inside the local LAN. For example, https://wl.net:443/mfpadmin. mfp.admin.global.logout Optional Clears the WebSphere user authentication cache during the console logout. This property is useful only for WebSphere Application Server V7. The default value is false. mfp.admin.hsts Optional Set this property to true to enable HTTP Strict Transport Security according to RFC 6797. For more information, see the W3C Strict Transport Security page. The default value is false. mfp.admin.ui.cors Optional The default value is true. For more information, see the W3C Cross-Origin Resource Sharing page. mfp.admin.ui.cors.strictssl Optional Set to false to allow CORS situations where the MobileFirst Operations Console is secured with SSL (HTTPS protocol) while the MobileFirst Server administration service is not, or conversely. This property takes effect only if the mfp.admin.ui.cors property is enabled. When you configure the MobileFirst Server live update service for your application server, you can set the following JNDI properties. The table lists the JNDI properties for the IBM relational database live update service. mfp.db.relational.queryTimeout Optional Timeout for executing a query in RDBMS, in seconds. A value of zero means an infinite timeout. A negative value means the default (no override). In case no value is configured, a default value is used. For more information, see setQueryTimeout. To know how to set those properties, see Setting up JNDI properties for MobileFirst Server web applications. When you configure the MobileFirst Server runtime for your application server, you need to set the optional or mandatory JNDI properties. mfp.admin.jmx.dmgr.host Mandatory. The host name of the deployment manager. WebSphere Application Server Network Deployment only. mfp.admin.jmx.dmgr.port Mandatory. The RMI or SOAP port of the deployment manager. WebSphere Application Server Network Deployment only. mfp.admin.jmx.host Liberty only. The host name for the JMX REST connection. For Liberty collective, use the host name of the controller. mfp.admin.jmx.port Liberty only. The port number for the JMX REST connection. For Liberty collective, the port of the REST connector must be identical to the value of the httpsPort attribute that is declared in the <httpEndpoint> element. This element is declared in the server.xml file of the Liberty controller. mfp.admin.jmx.user Optional. WebSphere Application Server farm: the user name of the SOAP connection. mfp.admin.jmx.pwd Optional. WebSphere Application Server farm: the user passsword of the SOAP connection. mfp.admin.serverid Mandatory for server farms and Liberty collective, optional otherwise. Server farm: the server identifier. Must be different for each server in the farm. Liberty collective: the member identifier. The identifier must be different for each member in the collective. The value controller cannot be used as it is reserved for the collective controller. mfp.topology.platform Optional. The server type. Valid values are:<ul><li>Liberty</li><li>WAS</li><li>Tomcat</li></ul>If you do not set the value, the application tries to guess the server type. mfp.topology.clustermode Optional. In addition to the server type, specify here the server topology. Valid values:<ul><li>Standalone<li>Cluster</li><li>Farm</li></ul>The default value is Standalone. mfp.admin.jmx.replica Optional. For Liberty collective only. Set this property only when the administration components that manage this runtime are deployed in different Liberty controllers (replicas). mfp.analytics.password The password that is used if the data entry point for the IBM MobileFirst Analytics is protected with basic authentication. mfp.analytics.username The user name that is used if the data entry point for the IBM MobileFirst Analytics is protected with basic authentication. mfp.device.decommissionProcessingInterval Defines how often (in seconds) the decommissioning task is executed. Default: 86400, which is one day. mfp.device.decommission.when The number of days of inactivity after which a client device is decommissioned by the device decommissioning task. Default: 90 days. mfp.device.archiveDecommissioned.when The number of days of inactivity, after which a client device that has been decommissioned is archived. This task writes the client devices that were decommissioned to an archive file. The archived client devices are written to a file in the MobileFirst Server home\devices_archive directory. The name of the file contains the time stamp when the archive file is created. Default: 90 days. mfp.licenseTracking.enabled A value that is used to enable or disable device tracking in Mobile Foundation. For performance reasons, you can disable device tracking when Mobile Foundation runs only Business-to-Consumer (B2C) apps. When device tracking is disabled, the license reports are also disabled and no license metrics are generated. Possible values are true (default) and false. mfp.runtime.temp.folder Defines the runtime temporary files folder. Uses the default temporary folder location of the web container when not set. embedded: Use the MobileFirst authorization server.
. When setting this value, you must also set the mfp.external.authorization.server.secret and mfp.external.authorization.server.introspection.url properties for your external server. mfp.external.authorization.server.secret Secret of the external authorization server. This property is required when using an external authorization server, meaning mfp.authorization.server is set to external and is ignored otherwise. mfp.external.authorization.server.introspection.url URL of the introspection endpoint of the external authorization server. This property is required when using an external authorization server, meaning mfp.authorization.server is set to external and is ignored otherwise. ssl.websphere.config Used to configure the keystore for an HTTP adapter. When set to false (default), instructs the MobileFirst runtime to use the MobileFirst keystore. When set to true, instructs the MobileFirst runtime to use the WebSphere SSL configuration. For more information, see WebSphere Application Server SSL configuration and HTTP adapters. mfp.push.db.cloudant.url Optional The Cloudant account URL. When this property is defined, the Cloudant DB will be directed to this URL. mfp.push.db.cloudant.username Optional The user name of the Cloudant account, used to store the database. when this property is not defined, a relational database is used. mfp.push.db.cloudant.password Optional The password of the Cloudant account, used to store the database. This property must be set when mfp.db.cloudant.username is set. mfp.push.db.cloudant.doc.version Optional The Cloudant document version. mfp.push.db.cloudant.socketTimeout Optional A timeout for detecting the loss of a network connection for Cloudant, in milliseconds. A value of zero means an infinite timeout. A negative value means the default (no override). Default. See https://github.com/cloudant/java-cloudant#advanced-configuration. mfp.push.db.cloudant.connectionTimeout Optional A timeout for establishing a network connection for Cloudant, in milliseconds. A value of zero means an infinite timeout. A negative value means the default (no override). Default. See https://github.com/cloudant/java-cloudant#advanced-configuration. mfp.push.db.cloudant.maxConnections Optional The Cloudant connector’s max connections. Default. See https://github.com/cloudant/java-cloudant#advanced-configuration. mfp.push.db.cloudant.ssl.configuration Optional (WAS Full Profile only) For HTTPS connections to the Cloudant database: The name of an SSL configuration in the WebSphere Application Server configuration, to use when no configuration is specified for the host and port. mfp.push.db.cloudant.proxyHost Optional Cloudant connector’s proxy host. Default: See https://github.com/cloudant/java-cloudant#advanced-configuration. mfp.push.db.cloudant.proxyPort Optional Cloudant connector’s proxy port. Default: See https://github.com/cloudant/java-cloudant#advanced-configuration. mfp.push.services.ext.security Optional The security extension plugin. mfp.push.security.endpoint Optional The endpoint URL for the authorization server. mfp.push.security.user Optional The username to access the authorization server. mfp.push.security.password Optional The password to access the authorization server. mfp.push.services.ext.analytics Optional The analytics extension plugin. mfp.push.analytics.endpoint Optional The endpoint URL for the analytics server. mfp.push.analytics.user Optional The username to access the analytics server. mfp.push.analytics.password Optional The password to access the analytics server. mfp.push.gcm.proxy.protocol Optional Can be either http or https. mfp.push.gcm.proxy.host Optional GCM proxy host. Negative value means default port. mfp.push.gcm.proxy.user Optional Proxy user name, if the proxy requires authentication. Empty user name means no authentication. mfp.push.gcm.proxy.password Optional Proxy password, if the proxy requires authentication. mfp.push.apns.proxy.type Optional APNs proxy type. mfp.push.apns.proxy.host Optional APNs proxy host. mfp.push.apns.proxy.user Optional Proxy user name, if the proxy requires authentication. Empty user name means no authentication. mfp.push.apns.proxy.password Optional Proxy password, if the proxy requires authentication. Find out some data source configuration details pertaining to the supported databases. When you deploy an application that is at least 40 MB with IBM MobileFirst Operations Console, you might receive a transaction log full error. The following system output is an example of the transaction log full error code. The content of each application is stored in the MobileFirst administration database. The active log files are defined in number by the LOGPRIMARY and LOGSECOND database configuration parameters, and in size by the LOGFILSIZ database configuration parameter. A single transaction cannot use more log space than LOGFILSZ * (LOGPRIMARY + LOGSECOND) * 4096 KB. The DB2 GET DATABASE CONFIGURATION command includes information about the log file size, and the number of primary and secondary log files. Depending on the largest size of the MobileFirst application that is deployed, you might need to increase the DB2 log space. Using the DB2 update db cfg command, increase the LOGSECOND parameter. Space is not allocated when the database is activated. Instead, the space is allocated only as needed. You must enable the seamless failover feature with WebSphere Application Server Liberty profile and WebSphere Application Server. With this feature, you can manage an exception when a database fails over and gets rerouted by the DB2 JDBC driver. Note: DB2 HADR failover is not supported for Apache Tomcat. By default with DB2 HADR, when the DB2 JDBC driver performs a client reroute after detecting that a database failed over during the first attempt to reuse an existing connection, the driver triggers com.ibm.db2.jcc.am.ClientRerouteException, with ERRORCODE=-4498 and SQLSTATE=08506. WebSphere Application Server maps this exception to com.ibm.websphere.ce.cm.StaleConnectionException before it is received by the application. In this case, the application would have to catch the exception and execute again the transaction. The MobileFirst and Application Center runtime environments do not manage the exception but rely on a feature that is called seamless failover. To enable this feature, you must set the enableSeamlessFailover JDBC property to “1”. Go to Resources → JDBC → Data sources → DataSource name. For more information about how to configure a connection to an HADR-enabled DB2 database, see Setting up a connection to an HADR-enabled DB2 database. Configure your application server to avoid database timeout issues. A StaleConnectionException is an exception that is generated by the Java application server profile database connection code when a JDBC driver returns an unrecoverable error from a connection request or operation. The StaleConnectionException is raised when the database vendor issues an exception to indicate that a connection currently in the connection pool is no longer valid. This exception can happen for many reasons. The most common cause of StaleConnectionException is due to retrieving connections from the database connection pool and finding out that the connection has timed out or dropped when it was unused for a long time. You can configure your application server to avoid this exception. The MySQL database closes its connections after a period of non-activity on a connection. This timeout is defined by the system variable called wait_timeout. The default is 28000 seconds (8 hours). The timeout value depends mainly on the number of opened connections in parallel but also on the minimum and maximum number of the connections in the pool. Hence, you must tune the different connectionManager attributes to identify the most adequate values. For more information about the connectionManager element, see Liberty: Configuration elements in the server.xml file. Note: MySQL in combination with WebSphere Application Server Liberty profile or WebSphere Application Server full profile is not classified as a supported configuration. For more information, see WebSphere Application Server Support Statement. Use IBM DB2 or another database that is supported by WebSphere Application Server to benefit from a configuration that is fully supported by IBM Support. On a Tomcat 8 application server, if you use a MySQL database, some calls from MobileFirst Operations Console to services return a 404 error. On a Tomcat 8 application server, if you work with a MySQL database, when you use MobileFirst Operations Console to delete an app, or add a new one, and try to refresh the console a couple of times, you might see stale data. For example, users might see an already deleted app in the list. To avoid this problem, change the isolation level to READ_COMMITTED, either in the data source, or in the database management system. For the meaning of READ_COMMITTED, see the MySQL documentation at http://dev.mysql.com/doc/refman/5.7/en/innodb-transaction-isolation-levels.html. To change the isolation level to READ_COMMITTED in the data source, modify the server.xml Tomcat configuration file: In the <Resource name=”jdbc/mfpAdminDS” …/> section, add the defaultTransactionIsolation=”READ_COMMITTED” attribute. To change the isolation level to READ_COMMITTED globally in the database management system, refer to the SET TRANSACTION Syntax page of the MySQL documentation at http://dev.mysql.com/doc/refman/5.7/en/set-transaction.html. To minimize the stale connection issues, check the connection pools configuration on each data source in WebSphere Application Server administration console. Log in to the WebSphere Application Server administration console. Select Resources → JDBC Providers → database_jdbc_provider → Data Sources → your_data_source → Connection pool properties. Set the Minimum connections value to 0. Set the Reap time value to be lesser than the Unused timeout value. Make sure that the Purge policy property is set to EntirePool (default). For more information, see Connection pool settings. Select Resources → JDBC → Data sources. Select Connection pool properties under Additional Properties. Modify the value of the Aged timeout property. The value must be lower than the MySQL wait_timeout system variable so that the connections are purged before MySQL closes these connections. Mobile Foundation reports errors, warnings, and informational messages into a log file. The underlying logging mechanism varies by application server. Mobile Foundation (MobileFirst Server for short) uses the standard java.util.logging package. By default, all MobileFirst logging goes to the application server log files. You can control MobileFirst Server logging by using the standard tools that are available in each application server. For example, if you want to activate trace logging in WebSphere Application Server Liberty, add a trace element to the server.xml file. To activate trace logging in WebSphere Application Server, use the logging screen in the console and enable trace for MobileFirst logs. MobileFirst logs all begin with com.ibm.mfp. Application Center logs begin with com.ibm.puremeap. For more information about the logging models of each application server, including the location of the log files, see the documentation for the relevant application server, as shown in the following table. For Apache Tomcat, you can use IBM Operations Analytics - Log Analysis or other industry standard log file monitoring tools to monitor logs and highlight errors and warnings. For WebSphere Application Server, use the log viewing facilities that are described in IBM Knowledge Center. The URLs are listed in the table in the MobileFirst Server section of this page. To enable trace to monitor back-end connectivity, see the documentation for your specific application server platform in the table of section MobileFirst Server of this page. Use the com.ibm.mfp.server.js.adapter package and set the log level to FINEST. MobileFirst Operations Console stores an audit log for login, logout, and for all administration operations, such as deploying apps or adapters or locking apps. You can disable the audit log by setting the JNDI property mfp.admin.audit to false on the web application of the MobileFirst administration service (mfp-admin-service.war). When the audit log is enabled, you can download it from MobileFirst Operations Console by clicking the Audit log link in the footer of the page. To diagnose login and authentication issues, enable the package com.ibm.mfp.server.security for trace and set the log level to FINEST. 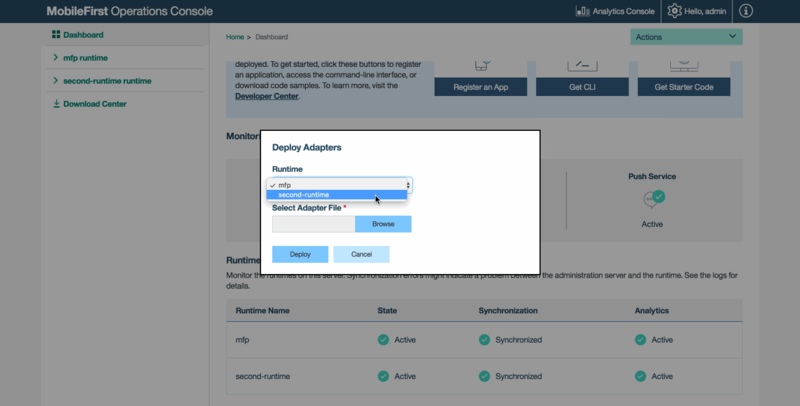 You can configure MobileFirst Server with multiple runtimes, creating a visual differentiation between application “types” in the MobileFirst Operations Console. Note: multiple runtimes are not supported in a Mobile Foundation server instance created by the Mobile Foundation IBM Cloud service. In the IBM Cloud service, you must create multiple service instances instead. Open the server.xml file of the application server. Typically located in the [application-server]/usr/servers/server-name/ folder. For example, with the MobileFirst Developer Kit, the file can be found it [installation-folder]/mfp-server/usrs/servers/mfp/server.xml. Make sure the dataSource is pointing to a different database schema. Make sure you have created another database instance for the new runtime. In the development environment, add createDatabase="create" in the properties.derby.embedded child-element. When a MobileFirst Server is configured with multiple runtimes, the registration of applications and deployment of adapters is slightly different. When performing these actions in the MobileFirst Operations Console, you now need to select the runtime to register or deploy to. When performing these actions using the mfpdev command-line tool, you now need to add the runtime name to register or deploy to. To register an application: mfpdev app register <server-name> <runtime-name>. To deploy an adapter: mfpdev adapter deploy <server-name> <runtime-name>. local is the name of the default server definition in the MobileFirst CLI. Replace local with a the server definition name you need to register or deploy to. runtime-name is the name of the runtime to register or deploy to. You can export a runtime configuration and import it to another MobileFirst Server using the REST APIs of the MobileFirst Server administration service. For example, you can setup a runtime configuration in a development environment, export its configuration and then import it to a testing environment for a quick set-up, and then further configure it for the specific needs of the testing environment. Find out all available REST APIs in the API Reference. License tracking is enabled by default. Read the following topics to learn how you can configure license tracking. For more information about license tracking, see License tracking. License tracking for client devices and addressable device is enabled by default. License reports are available in the MobileFirst Operations Console. You can specify the following JNDI properties to change the default settings for license tracking. Note: If you have a contract that defines the use of token licensing, see also Installing and configuring for token licensing. You can specify the following JNDI properties to change the default settings for license tracking. The number of days of inactivity after which a device is decommissioned by the device decommissioning task. License reports do not count decommissioned devices as active devices. The default value for the property is 90 days. Do not set a value lower than 30 days if your software is licensed by Client Device or by Addressable Device, or license reports might not be sufficient to prove compliance. A value, in days, that defines when decommissioned devices are placed in an archive file when the decommissioning task is run. The archived devices are written to a file in the IBM MobileFirst Server home\devices_archive directory. The name of the file contains the time stamp when the archive file is created. The default value is 90 days. Decommissions inactive devices, based on the mfp.device.decommission.when setting. Optionally, archives older decommissioned devices, based on the mfp.device.archiveDecommissioned.when setting. Generates the license tracking report. A value that is used to enable or disable license tracking in Mobile Foundation. By default, license tracking is enabled. For performance reasons, you can disable this flag when Mobile Foundation is not licensed by Client Device or by Addressable Device. When device tracking is disabled, the license reports are also disabled and no license metrics are generated. In that case, only IBM License Metric Tool records for Application count are generated. For more information about specifying JNDI properties, see List of JNDI properties for MobileFirst runtime. Mobile Foundation generates IBM Software License Metric Tag (SLMT) files. Versions of IBM License Metric Tool that support IBM Software License Metric Tag can generate License Consumption Reports. Read this to understand how to configure the location and the maximum size of the generated files. If the directories are not writable, the files are created in the log directory of the application server that runs the MobileFirst runtime environment. license.metric.logger.file.size: Maximum size of an SLMT file before a rotation is performed. The default size is 1 MB. license.metric.logger.file.number: Maximum number of SLMT archive files to keep in rotations. The default number is 10. To change the default values, you must create a Java property file, with the format key=value, and provide the path to the properties file through the license_metric_logger_configuration JVM property. For more information about IBM License Metric Tool reports, see Integration with IBM License Metric Tool. By setting a property, you can let HTTP adapters benefit from WebSphere SSL configuration. By default, HTTP adapters do not use WebSphere SSL by concatenating the Java Runtime Environment (JRE) truststore with the MobileFirst Server keystore, which is described in Configuring the MobileFirst Server keystore. Also see Configuring SSL between adapters and back-end servers by using self-signed certificates. Adapters running on WebSphere use the WebSphere keystore and not the MobileFirst Server keystore. If the ssl.websphere.alias property is set, the adapter uses the SSL configuration that is associated with the alias as set in this property.